A question before the whine...can anyone identify these needles? I was hoping to buy needles from a particular vendor at the Spinners and Weavers Day. However she wasn't there this year. Two years ago I bought some vintage needles from her, small dpns. As I walked down Burwood road a couple of weeks ago after leaving the Open Day, I saw these needles in a tin in the local Vinnies. There were eight of them, five yellow and three pink. They feel quite bendy and flexible and I wondered how they would go. They weren't dear at all so I bought them all. To my surprise, I really liked them. They are too long and I'll have them cut down, but they feel good to use, almost like my favourite casein needles. They look oldish plastic, have quite a bend to them but knit well. These are equivalent of 3 mm. Now I bought this wool at the Open Day. it says 5 ply crepe. Certainly crepe finish but I think it resembles the thickness of Lion Brand Magic Stripes more than 5 ply. That would make it 6 ply, American sportweight. The needles shown are 3.0 mm and the fabric is very firm. This is the spring green colour I wanted when I made the brown Zokni socks. I loved it and bought it immediately I saw it. Not expensive, but not cheap either. 200gm in hank which wound well. 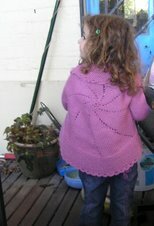 I tried two different patterns but frogged them both as the design did not show up well. I decided to let the colour speak for itself. Now for whine #1. The wool is splitty, no matter what needles I use. It's as bad as the Wildfoote luxury sock yarn which makes beautiful feeling fabric but splits constantly. I've done several pairs of sock in Wildfoote and vowed never again. Whine #2. I could sort of put up with the splitting of the wool, but I have another problem. It seems to be badly plied. If I hav more than about a handspan of length of wool between needles and ball of yarn, that length immediately folds up on itself and twists as if making a twisted cord for a belt etc. If I disregard it for a few stitches, it seems to easily fall into a knot, or if I pull at the two sides of the twist, another knot forms. I need more yarn than 9" to work with an even tension. Is this a problem with the plying? I'm not a spinner although I do have a traditional Ashford wheel and did some many years ago. Is thre any way of fixing this or of handling the yarn in a particular way so I can use it? Or do I jsut put it down to experience and put it back in the stash. 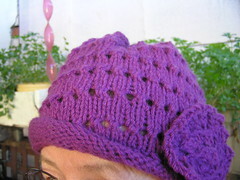 It might work if crocheted but I'm not about to try that in a hurry either. I have the seller's email and a webpage on Ozemail so I could contact her about the wool, but thought I'd ask here first for ideas. Oh, the colour of the wool is so nice and it looks good too. I don't have any solutions. Bah Humbug on your behalf though! !